When Central City Brew Pub owner Darryll Frost was planning his fundraiser event, A Night for Autism, he decided to invite TapSnap to help break the ice, and give the event an immediate social media presence. TapSnap allowed the event guests to take their picture with a touch of the fingertip to the giant 42-inch multi-touch screen, draw on their photos, and add digital props like funny hats or googly eyes. When they were done, they shared their creation instantly on social media. “TapSnap was a great icebreaker. It created theatre at our event. And it was fun,” said Frost. 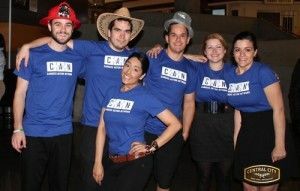 The $50-a-plate dinner attracted 200 guests and raised $40,000 through auctions, raffles and silent auctions for two organizations: the Canucks Autism Network and the Canadian-American Research Consortium. TapSnap is just one more way to help get the message out. “Because of TapSnap, we had pics from the event Tweeted, we had the event on Facebook and on our Web site in no time at all,” said Frost.